In 1635 he was promoted to the deanery of Worcester, having before had a promise of a canonry of Windsor, which he never enjoyed. In 1640 he was vice-chancellor of the university of Oxford, in the execution of which office he met with some trouble from the members of the long parliament. Upon breaking out of the civil wars, he sent all his plate to the king, and declared, that he would rather, like Diogenes, drink in the hollow of his hand, than that his majesty should want; and he afterwards suffered much for the royal cause. In consideration of this, upon the death of Dr. W r alter Balcanqual, he was nominated to the deanery of Durham in January 1645-6; but was prevented from being installed by his death, which happened at his college March the 3d following. He was | interred about the middle of the chapel there and over his grave was a marble monument fastened to the north wall, at the expence of his widow Elizabeth, daughter of Dr. Charles Sonibanke, some time canon of Windsor, afterwards wife of Dr. Gerard Langbaine, who succeeded Dr. Potter in the provostship of Queen’s college. He was a person esteemed by all that knew him to be learned and religious exemplary in his behaviour and discourse, courteous in his carriage, and of a sweet and obliging nature, and comely presence. 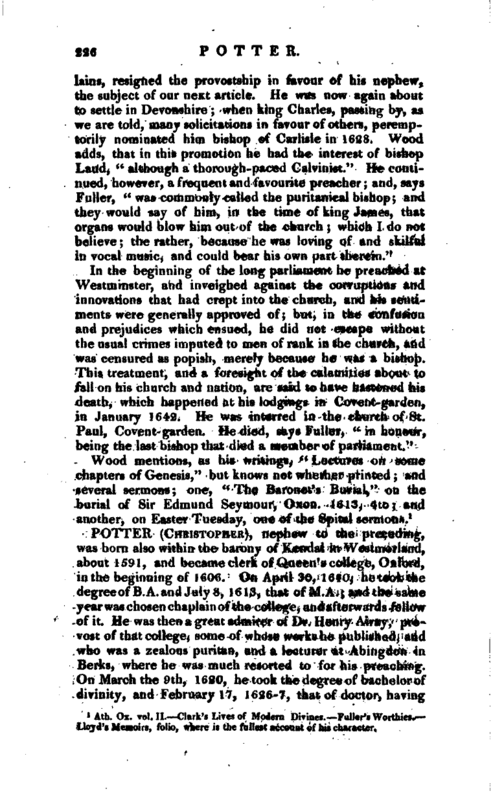 But he was more especially remarkable for his charity to the poor; for though he had a wife and many children, and expected daily to be sequestered, yet he continued his usual liberality to them, having, on hearing Dr. Hammond’s sermon at St. Paul’s, been per* suaded of the truth of that divine’s assertion, that charity to the poor was the way to grow rich. He translated from Italian into English, “Father Paul’s History of the Quarrels of Pope Paul V. with the State of Venice,” London, 1626, 4to and left several Mss. 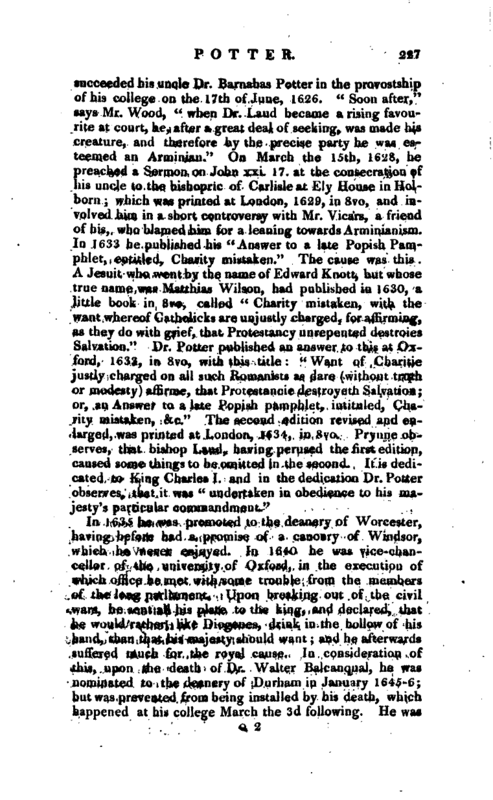 prepared for the press, one of which, entitled “A Survey of the Platform of Predestination,” falling into the hands of Dr. William Twisse, of Newbury, was answered by him. 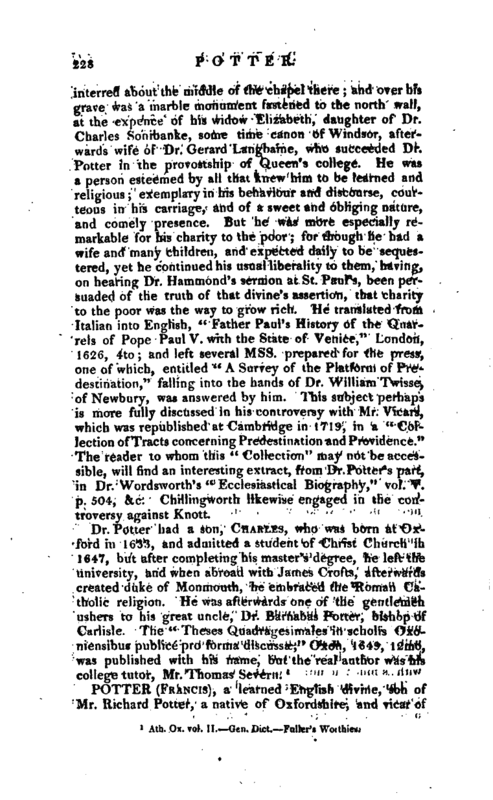 This subject perhaps is more fully discussed in his controversy with Mr. Vicars, which was republished at Cambridge in 1719, in a “Collection of Tracts concerning Predestination and Providence.” The reader to whom this “Collection” may not be accessible, will find an interesting extract, from Dr.Potter’s part, in Dr. Wordsworth’s “Ecclesiastical Biography,” vol. V. p. 504, &c. Chillingworth likewise engaged in the controversy against Knott. 1 Ath. Ox. vol. II. Ge. Dict. Fuller’s Woithies.